You will be very unlucky to leave The Vyne without seeing a Mallard. They are found all year on both the ornamental and the watermeadow lakes. 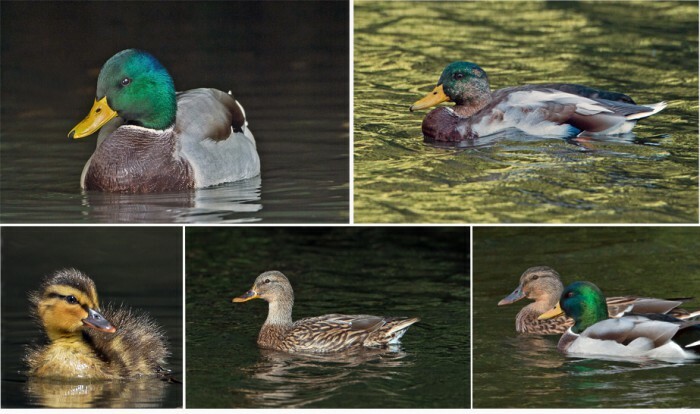 In Britain the Mallard is a very familiar duck; found on park lakes and on small ponds it is one of the first birds that children encounter because of its ready association with people and liking for being fed. It is however a record holder. It is the world’s most widespread duck – happy to live close to people in towns but also inhabiting both fresh and salt water in some of the wildest and most remote parts of the world. It is to be found in Europe, North Africa, Asia and North America and has even persuaded us to take it to Australia and New Zealand. Ability to recognise a Mallard is important for bird watching beginners because it is the key to recognising other types of duck. The handsome drake (male) has an iridescent green-blue head; the duck (female) is brown and quite plain. The Mallard is a ‘dabbling’ duck. It can dive if it wants to but mainly remains on the surface, ‘up-ending’ to get food from underwater. In winter, large numbers of Mallard come to Britain from Northern and Eastern Europe as well as from Iceland, before returning in the spring. So the Mallard you see dabbling at the Vyne during the winter may be well travelled. It has the reputation of nesting in unusual places, often some distance from water. I knew someone who lived near the top of a city–centre, high-rise building who complained bitterly of being kept awake by the Mallard family outside his window. Mallards breed as early as February but late broods are also common. They are a common sight on both the ornamental lake and watermeadow. A clutch consists of 11-14 eggs and although the female and ducklings remain together for several weeks, the very cute young are self-sufficient very soon after hatching. Families are often rapidly depleted through predation – pike, rats, foxes, snakes, herons and birds of prey all take their toll. In late summer, the drakes moult into what is termed ‘eclipse’ plumage. During this time they look quite like ducks (female) and the moult lasts for several weeks rendering them flightless. Young drakes born earlier in the year also acquire their adult plumage in autumn.